In recent years we've seen that cheaply made jewelry is often contaminated with chemicals such as lead, cadmium, arsenic, chlorine, PVC, bromine, chromium, nickel and mercury, all of which have been linked to some serious health issues like cancer, liver toxicity, impaired learning, immune system problems, birth defects, allergies, conception problems and more. That said, many young children love to play dress up with their very own collection of jewelry. Now, you can ban all play jewelry and curtail imaginative play or say yes to fun and dress up by providing your child with some lead-free, non-toxic jewelry piece of their own. Below are some great places to find fun, beautiful and safe play jewelry for your child. 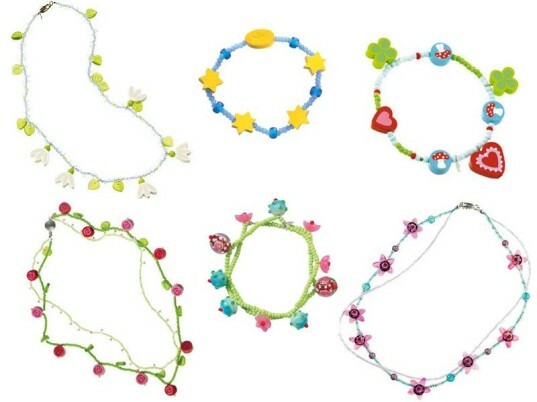 Blueberry Forest offers a large collection of HABA Children’s Jewelry, made in Germany with child-safe materials such as wool felt, glass beads and wood. All of the HABA pieces are fun, whimsical and pretty enough to intice any little girl. Bonus, you can even pick up the lovely HABA Cherry Blossom Mini Jewelry Treasure Box so your little one has a nice place to tuck away all her treasures. Shains is a very cool company that offers all sorts of necklaces, chokers, bracelets and more made with sustainable, recyclable materials. All products are 100% easy to customize by your child. Best of all, every Shains piece is affordable and they even offer accessories that will appeal to older kids and teens. If you’re looking for safe and imaginative jewelry for your child, the Collage Jewelry Kit from Artterro has got you covered. This beautiful kit is packed full of everything your child needs to make his or her very own jewelry creations. 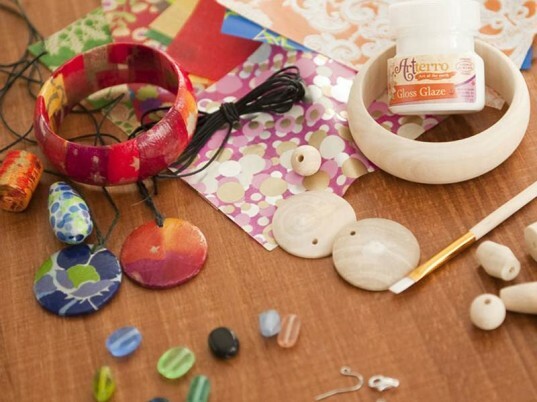 Everything in the kit is non-toxic and eco-friendly, right down to the packaging, and it includes decoupage papers, wooden bangle, wooden beads, pendants, glass beads, cotton cord, glaze, brush, jewelry findings, instructions and idea sheet. Ages 7 and up due to small pieces. Distorted Earth creates jewelry for adults but also many pieces that are very appropriate for little ones. 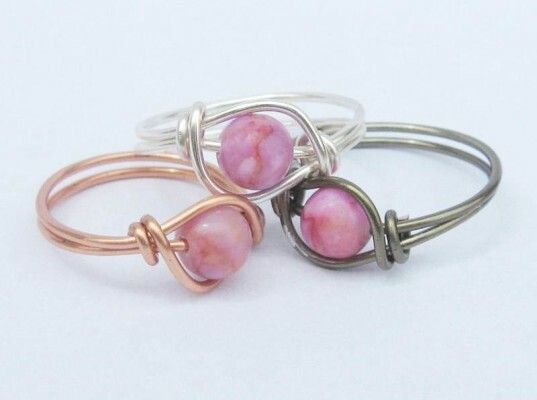 For instance, their lovely Pink Matrix Jasper Ring (shown above) comes in sizes 1-14, so even the tiniest of fingers can wear it and feel like a princess while doing so. Each piece is handmade with lead-free materials such as tarnish resistant wire and gemstone beads, with an artistic boho flare. Everything is also one of a kind and jewelry prices are very affordable. Informal Elegance has so many pieces of lovely kid-minded jewelry that your little one’s eyes will pop. For example, there’s the adorable, nickle-free, lead-free Childrens Beaded Bracelet Ladybug shown above. Colors galore fill this sweet shop and there are sizes for young and older kids. Bonus – this cool shop is one of the few around with a decent selection of young boy-minded pieces. Of course, for crafty kids, there’s always the option of making some homemade non-toxic jewelry. Visit EcoBeads for handmade individually cut and carved beads dyed with vibrant colors using vegetable dyes. You can also check out Bead Bazaar kits or make homemade beads out of organic clay then string them on hemp. If you’re looking for lead-free, nickle-free charms to string on hemp, visit Charm Factory. Also see our tutorial on how to make recycled lead-free jewelry. Blueberry Forest offers a large collection of HABA Children's Jewelry, made in Germany with child-safe materials such as wool felt, glass beads and wood. All of the HABA pieces are fun, whimsical and pretty enough to intice any little girl. 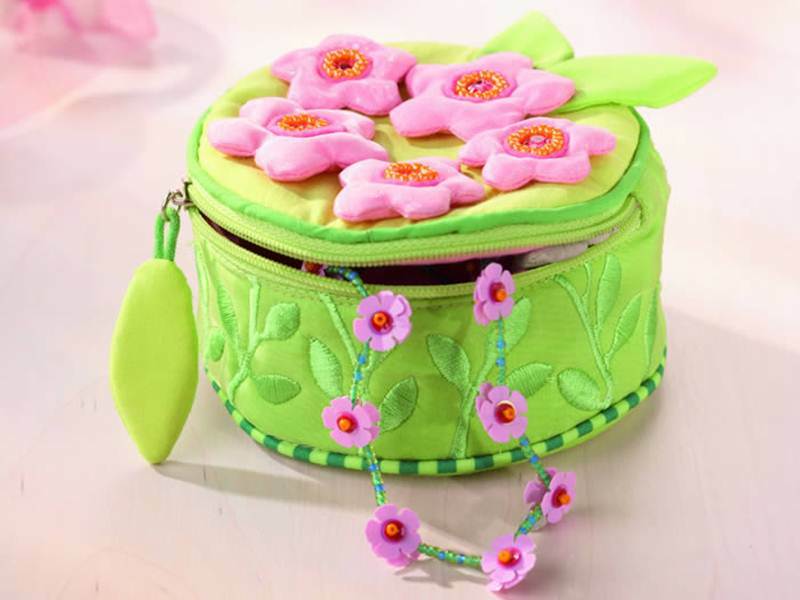 Bonus, you can even pick up the lovely HABA Cherry Blossom Mini Jewelry Treasure Box so your little one has a nice place to tuck away all her treasures. If you're looking for safe and imaginative jewelry for your child, the Collage Jewelry Kit from Artterro has got you covered. This beautiful kit is packed full of everything your child needs to make his or her very own jewelry creations. Everything in the kit is non-toxic and eco-friendly, right down to the packaging, and it includes decoupage papers, wooden bangle, wooden beads, pendants, glass beads, cotton cord, glaze, brush, jewelry findings, instructions and idea sheet. Ages 7 and up due to small pieces. Informal Elegance has so many pieces of lovely kid-minded jewelry that your little one's eyes will pop. 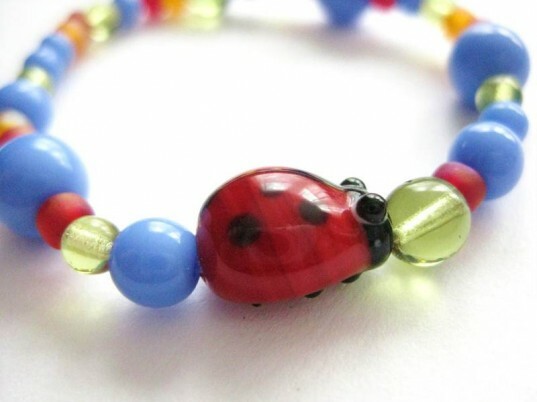 For example, there's the adorable, nickle-free, lead-free Childrens Beaded Bracelet Ladybug shown above. Colors galore fill this sweet shop and there are sizes for young and older kids. Bonus - this cool shop is one of the few around with a decent selection of young boy-minded pieces. Of course, for crafty kids, there's always the option of making some homemade non-toxic jewelry. Visit EcoBeads for handmade individually cut and carved beads dyed with vibrant colors using vegetable dyes. You can also check out Bead Bazaar kits or make homemade beads out of organic clay then string them on hemp. If you're looking for lead-free, nickle-free charms to string on hemp, visit Charm Factory. Also see our tutorial on how to make recycled lead-free jewelry.